At the heart of the generously sized 45 mm titanium case of the new Admiral’s Cup from Corum, is the high-precision automatic Caliber CO 9000, which for the first time appears in an entirely open-worked architecture with a clearly visible gear train. The look is heightened by the absence of a dial, while a transparent date disk bearing fully visible numerals lends an even more modern touch. While their base is applied on an anthracite-coloured dial, the Superluminova-enhanced hour markers are extended to the point where they appear to be levitating around the rim of the date disk. This play on contrasts and depth effects is accentuated by the galvanic treated inner bezel ring. Strategically placed black PVD inlays on the twelve-sided bezel add to the effect. The watch comes with a power reserve of 42 hours and is water-resistant to 300 metres. 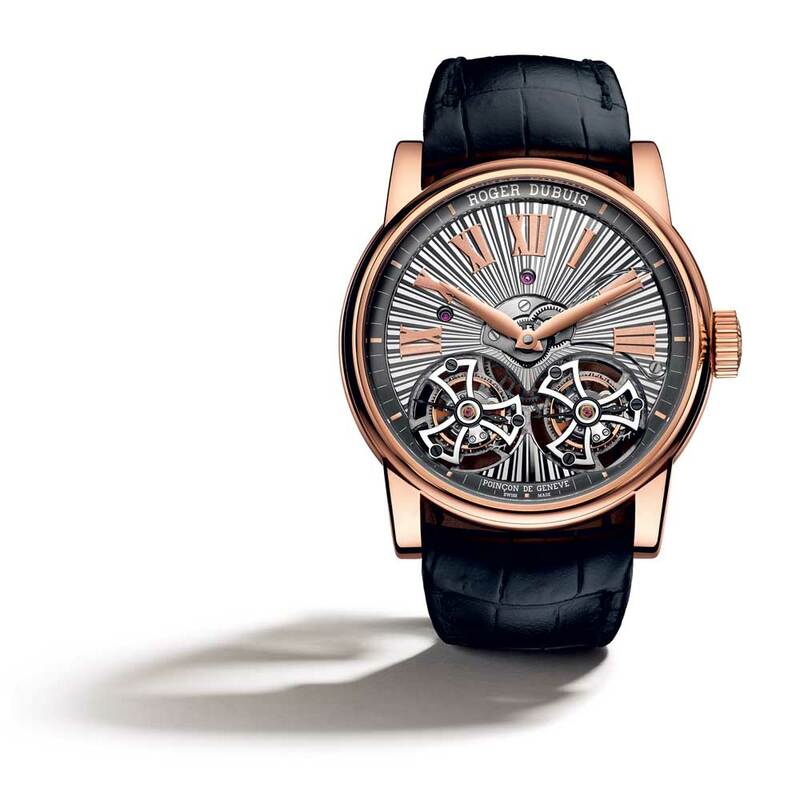 A reinterpretation of Robert Greubel and Stephen Forsey’s first watch, the Double Tourbillon 30°, it features an asymmetric positioning of the double tourbillon achieved through the inversion of its outer cage while retaining the one-minute rotation of the inner tourbillon cage and the four-minute rotation of the outer tourbillon cage. The movement is housed in a 43.5 mm diameter case with a curved lateral window in the case band at 8 o’clock. Calibre 25, unveiled by Blancpain in 1998, was the world’s first self-winding tourbillon with an 8-day power reserve. Sixteen years later the brand’s new self-winding tourbillon movement has an exceptional 12-day power reserve guaranteed by a single barrel and is enclosed in a space that is just 6.10 mm thick and 30.60 mm in diameter. On the dial, the off-set tourbillon carriage at 12 o’clock has been enlarged to offer a view of the new design of the balance and the escape-wheel. One of the most complex timepieces in the market, the 45 mm rose gold case of this watch houses a minute repeater, tourbillon and perpetual calendar integrated into a single complete movement. The minute repeater which is wound elegantly by rotating a knurled ring under the bezel a quarter turn clockwise sounds the hours, quarter-hours and minutes on two cathedral gongs. The Grand Feuenameled white dial is satin-finished. The sides of its iconic lugs, traditionally straight and elongated, have been bevelled on this model. This titanium and rose gold tourbillon model in a 48 mm case features a rotating carriage in the upper left hand part of the dial, as well as incorporates a date indication. This asymmetrical aesthetic serves to highlight the tourbillon mechanism that is visible through the dial opening. The date driven by a patented system is displayed by means of a disc surrounding the carriage. It is powered by the automatic El Primero 4035 D chronograph calibre. This ultra-thin watch with a flying tourbillon stands out for its baguette-set skeleton movement, the only one of its kind in the market. It combines the Piaget prowess at watchmaking with its unrivalled expertise in gem-setting. The movement in 14K gold with platinum micro-rotor is set with 561 brilliant-cut diamonds (around 1.8 carat) and 71 baguette-cut diamonds (around 1.1 carat). The case in 18K white gold is set with 650 brilliant-cut diamonds (around 4.4 carat), 92 emerald-cut diamonds (around 2.9 carat) and 44 baguette-cut diamonds (around 7.7 carat). The 18K white gold crown is set with eight baguette-cut diamondsaround 0.2 carat). The re-issue of a 150 year old classic tourbillon still features the three bridges, but this time, arrow-shaped in titanium treated with PVD, beveled and sandblasted, and comes in a 45 mm diameter pink gold case. It is powered by a self-winding mechanical movement. The tourbillon is at the 6 o’clock position and a micro-rotor is mounted under the barrel at the 12 o’clock position. It is water-resistant to 30 metres and comes with a power reserve of 70 hours. This tri-axial tourbillon is the fifth in the Histoire de Tourbillon series launched in 2009 to showcase Harry Winston’s pursuit of excellence in innovation by presenting tourbillons in a series of spectacular new forms. Packed in a 47 mm diameter 18K rose gold case, the display of this watch consists of ex-centered hours at 2 o’clock, ex-centered minutes at 4 o’clock, seconds indication on the tri-axial tourbillon at 9 o’clock, and power reserve at 11 o’clock. The tourbillon is under a domed sapphire crystal. The mechanical, manual-winding, tri-axial tourbillon provides 50 hours of power reserve. It comes in a limited edition of 20 pieces. The 45.5 diameter 18K gold watch is driven by a manually wound caliber (P591) controlled by a flying tourbillon that rotates once a minute, and that can be seen through the opening at 9 o’clock. The silvered opaline dial features riveted 18K red gold numerals and indexes. It comes with a power reserve of 50 hours and is available in a limited edition of 30 pieces. Enclosed in a 43 mm-diameter ‘Fairmined’ rose gold case, this watch with a refined grey dial with subtle sunburst motifs is powered by the L.U.C 02.01-L movement which drives a tourbillon and a power reserve indicator located at 12 o’clock. It comes with a power reserve of nine days. This 25-piece limited series is water-resistant to 50 metres. The term `Fairmined’ in the name refers to the fact that the gold used was mined in a responsible manner, and that the miners were compensated fairly. The certification is provided by the South American NGO Alliance for Responsible Mining and Chopard is the first watchmaker that has used `Fairmined’ gold. This wristwatch in a 47 mm diameter gold case combines a split-second (Rattrapante) chronograph with Montblanc’s patented ExoTourbillon, where a large balance oscillates outside the tourbillon’s rotating cage, which makes this timepiece far more energy efficient and accurate than a conventional tourbillon. The three-dimensional regulator dial in gold and decorated with grand feu enamel elements, includes a display for a second time zone with a day/night indicator. Two hour hands sweep around the smaller dial at 6 o’clock: a skeletonised hand for the hour in the current local time zone and a blued hand for the hour in the wearer’s home time zone. It has a power reserve of 50 hours and comes in a limited edition of 18 pieces. The 47 mm diameter platinum case of this watch packs a tourbillon, second time zone and a moon phase. The moon phase is ‘on demand’ meaning it is revealed by pressing the pusher at four o’clock when a disc appears from under the 4 o’clock indicator and spreads over the tourbillon window. The second time zone is indicated by a 24-hour disc at 12 o’clock. The watch is powered by the manually wound calibre 9440 MC. This 45 mm diameter watch in pink gold is powered by a pink gold, hand-wound movement, RD102, with a double flying tourbillon with differential, hours and minutes. The dial features charcoal grey Roman numerals appliqués, pink gold flange and black minute-circle. It has a power reserve of 50 hours, is water-resistant to 30 metres and comes in a limited edition of 88 pieces. The pink gold version with a charcoal grey flange on the dial, and the white gold version, are produced in unlimited numbers.